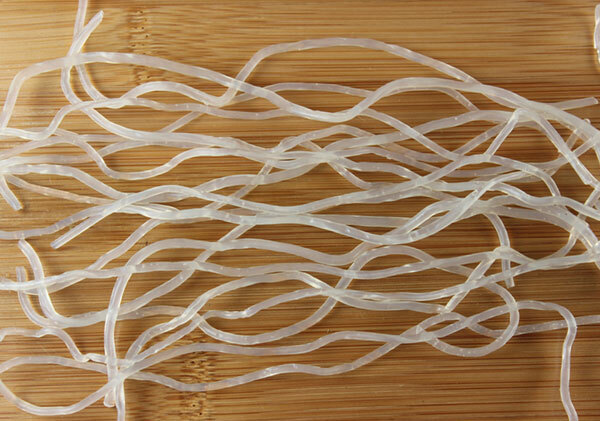 Kelp noodles, a semi-transparent spaghetti shaped noodle, are a gluten-free low-calorie alternative to grain based pastas. We bought our first package way back in 2005 when they first started appearing at many California-based natural food co-ops. At the time, not many people were using them or even knew they existed. Today, they are much more popular among health-conscious consumers, especially individuals with gluten allergies or food sensitivities. They are also widely used by those adhering to a raw vegan diet, along with spiralized zucchini, as a pasta replacement. How are Kelp Noodles Made? 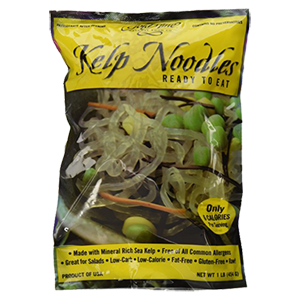 Kelp noodles are made from the thin clear gel-like inner layer of kelp seaweed, after the green outer "skin" has been removed or "peeled." 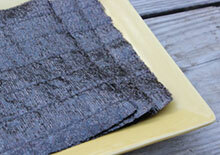 As kelp seaweed is known for its strong "fishy" flavor, this is done to allow for a more neutral taste. The inner flesh is dried as a powder then blended with water and sodium alginate, which helps to solidify its shape into strands of noodles. Are they technically a "raw food?" Both the brands Sea Tangle and Gold Mine say their products are "raw." 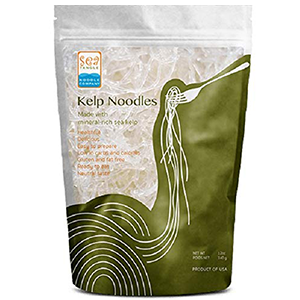 According to direct communications with the company Sea Tangle, they say that "During the process from farming to manufacturing of the kelp noodles... there is no cooking or boiling involved. The water that we use is regulated at 101 degrees." The outer skin is peeled off. It is then ground up into a powder form. The powder is combined with water in a giant mixer. Sodium alginate is added to help bond the water and powder into solid form. It is then turned into noodles via specialized strainers. What is Sodium Alginate Exactly? Sodium alginate is used commercially in a variety foods, from ice cream to cheese, primarily as a stabilizer, emulsifier and thickening agent. 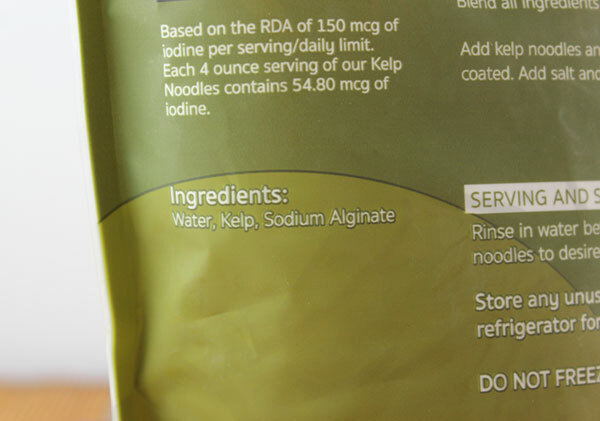 The sodium alginate used in kelp noodles is derived from brown seaweed. 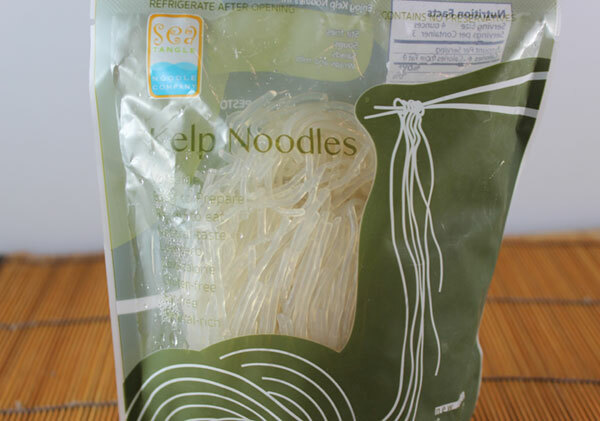 According to the Sea Tangle website, their kelp noodles contain about 30% total kelp seaweed. (*) So, the rest would seemingly be water and sodium alginate. The algin or alginate component in whole kelp seaweed is a viscous fiber high in mucilaginous compounds. These substances are known to help chelate heavy metals, absorb radiation and toxins from the digestive tract and further eliminate them from the body. With the removal of the green outer layer, kelp noodles have lost some mineral and all chlorophyll content compared to kelp or kombu seaweed. There really is no comparison in our opinion. Kelp pieces, powder or flakes are a whole food are far more nutritious if you're looking to increase mineral or iodine uptake. 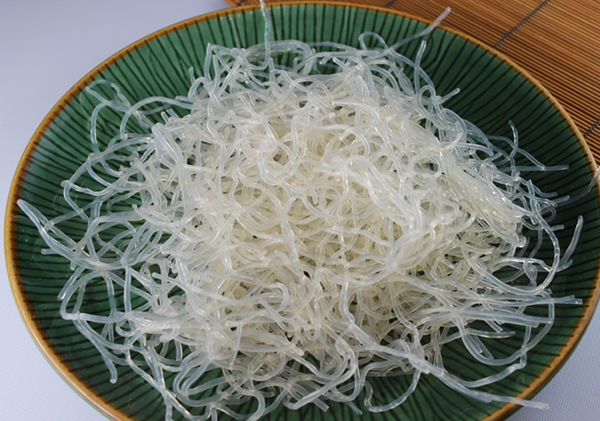 Kelp noodles main beneficial feature is that they offer an alternative to grain-based pastas and are a low-calorie food. 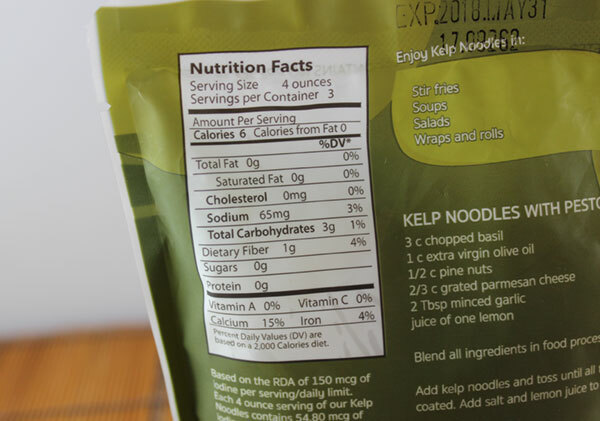 According to the nutrition label on Sea Tangle's kelp noodle product, a 4-ounce serving has 15% DV for calcium, 4% for iron and 4% for dietary fiber, based on a 2,000 calorie diet. Some people advertise that they are a good source of iodine. Yes, kelp seaweed is known to be an iodine-rich food source, but kelp noodles probably don't contain a whole lot of this nutrient. Iodine is mostly concentrated in the outer skin, but some is present in the clear inner layer. Plus the noodles, as we mentioned, are only about 30% total kelp. We see that Sea Tangle actually claims a 4-ounce serving contains approximately 54.8 mcg of iodine. So, either way, it is good to be aware if you have iodine sensitive health issues or attempt to use it for supplementation purposes. Kelp noodles are not very tasty straight out of the bag. They have a bland flavor and crunchy chewy texture when consumed cold. For our personal taste preferences, we find they are much more pleasant to eat when softened slightly. Marinating/Adding Heat- This is achieved by using a salt (miso, shoyu or sea salt) and an acid medium, like lemon or vinegar. We basically make a dressing or sauce and massage it into the noodles, letting them sit at room temperature for at least several hours. It also helps to warm them a bit in a food dehydrator, covered in a bowl, as marinating is sometimes not enough to soften them to an edible consistency. This is an especially good preparation technique for those adhering to a raw vegan diet. Adding Heat or Hot Water - Depending on your dietary practices, you can prepare the noodles with a sauce of choice and warm them up, as mentioned, in a dehydrator to soften. 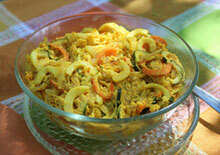 This is how we make our raw pad thai and macaroni n'cheese recipes. Other methods could involve adding the kelp noodles at the end to bowls of hot soup, allowing them to steep for a few minutes. They are delicious in miso soup with seaweeds, shiitake and make a great gluten-free "noodle bowl" served with homemade kimchi. 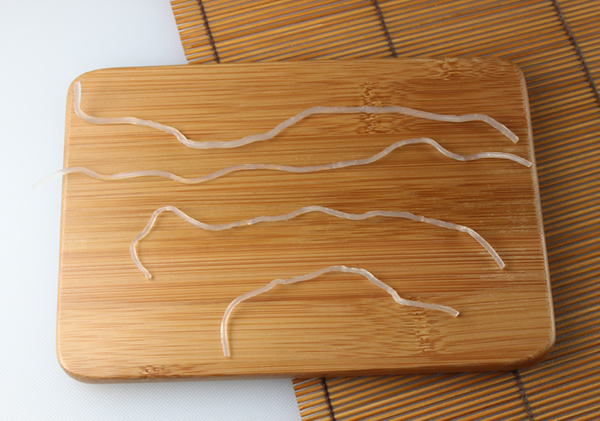 The noodles themselves come in varying lengths between 3-12 inches. 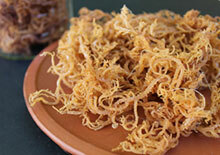 You can of course cut them into shorter strands depending on the type of recipe you are preparing. Also, rinsing them in pure filtered water is recommended to remove the sodium alginate coating that they are packaged in, which has a sort of bleach-like odor. Rinsing them also helps to untangled them a bit. 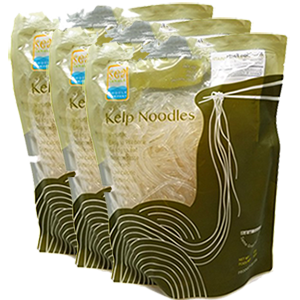 Currently, as of 2017, there are two main companies making kelp noodles in the U.S.
Sea Tangle - First company to make the noodles way back in 2001. 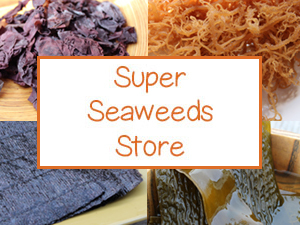 They are based in San Diego CA and have 3 kelp noodle varieties plus a seaweed salad mix. They test their ingredients for both radiation as well as heavy metals. Gold Mine - This company also sells many other products catering to macrobiotic, gluten-free and raw diets. They are based in Poway, CA (near San Diego) and have been selling quality heirloom-sourced organic foods and Ohsawa brand products since the late 1980's. 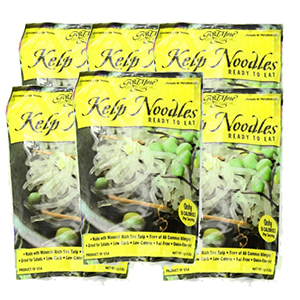 Kelp noodles can be marinated in many types of pasta sauces, like pesto, marinara and our favorite nut-based Alfredo sauce. They also make a delicious salad ingredient when dressed and softened slightly, or can be used in soups, curries or even "steam-fry's." It is important to never freeze kelp noodles or they will essentially turn to mush. Although they are often found in the refrigerated section of most stores, interestingly Sea Tangle claims they can be stored in the pantry as they are shelf stable.